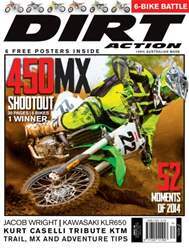 DIRT ACTION 189 is the magazine you’ve been waiting for if a 2015 450F motocrosser is in your future. We’ve tested the best of the best and found a worthy winner in the impressive line-up. This is the most exhaustive 450 shootout in Australia and you can’t miss it. We put together our annual 52 Moments That Mattered list with all the highlights and lowlights of 2014. We test the KLR650 and take a close look at the year Jacob Wright had going from privateer to factory and winning. There’s more…plenty more…but you’ve got to dig in from here. 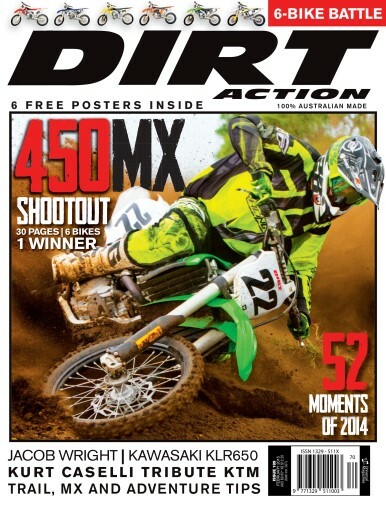 At the track and on the trails…it’s all DIRT ACTION.